By Graham Young - posted Thursday, 21 September 2017 Sign Up for free e-mail updates! “Renewables are cheaper” is the latest three word slogan to slink into political discourse. And if they’re “cheaper”, the argument goes, then the cure for high electricity prices is more renewables. The cheapness claim is based on pricing sleight-of-hand: the boosters give you the price of the product, minus all the things you need to make it work. Not that renewables don’t have their place, but when they are added to our electricity network they are the primary culprit for high prices. Around the world there is a statistically significant relationship between the penetration of renewables and the price of electricity. 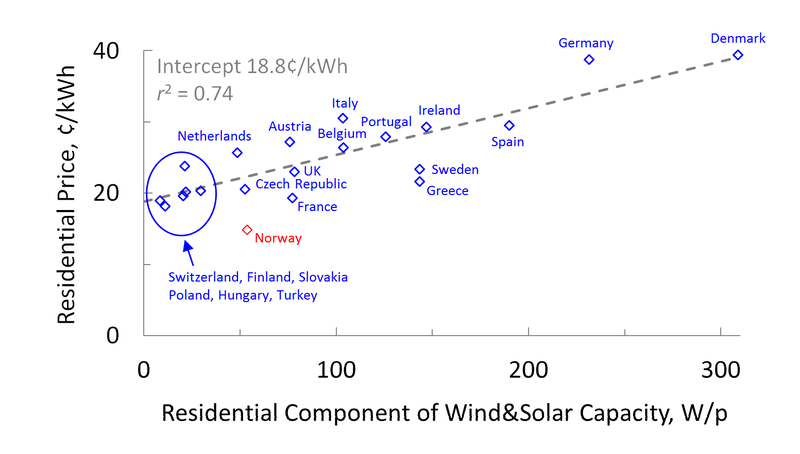 Denmark and Germany have the highest power prices and the greatest penetration of renewables. Hungary, US and Croatia the lowest, and the least penetration of renewables. An LGC represents a megawatt hour of renewable energy production and in August the spot price was around $85 per MWh. Problem is that the spot price of a MWh of electricity is $79, six dollars less. So the renewable energy generator gets paid more, just for turning-up, than a conventional generator receives for pumping out power all day. Then there is their unreliability. Wind and solar only work when it is windy and sunny, and this rarely happens at periods of peak demand, and doesn’t happen all day long.